Last year, Greek Progressive Power / Heavy Metal act Wardrum released their debut album through Steel Gallery Records – entitled “Spadework”, this effort was packed with a bunch of songs that increases the rhythm of my heart to a higher level. Yeah, really good piece it was – back then, Wardrum reflected a perfect form of musical chemistry delivering their stuff with an obvious wink to US Metal, my favourite style of music as long as I live! One year later on now and the guys are back in business with the follow up “Desolation”, again via Steel Gallery Records available. Wardum received a facelift to the extent that a new singer was recruited by the name of Yannis Papadopoulos (also active in Crosswind and Until Rain). Well, I can only admit that this is a very good singer! With all respect for his predecessor who also had a great throat to offer but Yannis obviously takes the music of Wardrum to a new and higher level. His voice (in the vein of almighty Carl Albert and Rob Rock) has a higher range and above all, I also hear more stability which only suits the band in its total package. This type of music so called Progpower Metal is in a phase where the competition is very strong present and as I’ve mentioned many times before – only the very best will survive. To the question if Wardrum will survive the battle – I say yes! In their very existence of nearly two years, these guys are once again able to take us all by surprise with a second album that sounds terrific! If you carefully listening to musical details, you can’t avoid the fact hearing nothing but compositions finding their way to complete perfection. High vocals never lose the pedals, technical melodic guitar lines (shred guitar maniacs, stay focussed! ), good organized bass and drum works… great job guys! To le there is a lot to enjoy while listening to all of the songs – if you like to band your head you should check out the fast one ‘Unforgiving’, ‘Sign Of Teason’, ‘Higher Sky’ and ‘No Retreat’… US Power Metal addicts longing for shining steel in the vein of Ancient Creation, Vicious Rumors, New Eden, Destiny's End and stuff will have a blast. Dark powers (think Warlord) lurking from behind and still haunts your dreams at night during ‘Tide lakes’. One of the absolute highlights to me is ‘Urban Storm’ and its fantastic song structure. I’d like to kneel down and pray to the gods of Metal to bring out more pieces like this in the future! 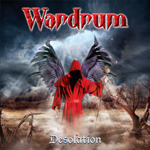 The sound quality is very good what does increase my appreciation for Wardrum’s new effort “Desolation” even more.